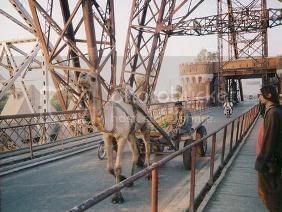 Any vistor to Sukkur-Rohri Pakistan is usually awe struck by the largest man made monuments in the area. They are two in number. One is the 118 year old Lansdowne bridge and the other is the 45 year old Ayub Arch. 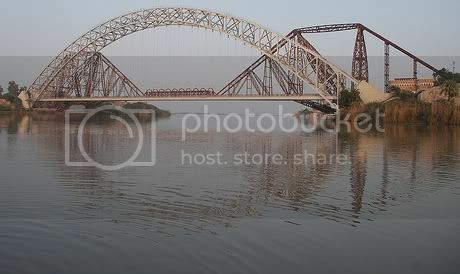 Indus was bridged at Attock in 1887 and that allowed Railways in India to run from the Western most post of Khyber Pass to the eastern city of Calcutta. India’s rail link to the port of Karachi was however, still broken at the Indus flowing between the towns of Rohri and Sukkur. Indus was not bridged between Kotri and Hyderabad either therefore trains ran on Karachi-Jamshoro-Larkana-Sukkur route as early as 1879 and then they were ferried across to Rohri and vice versa on a river ferry. At Sukkur the river Indus flows through a gap in a range of low limestone hills and gets divided into two channels (Sukkur and Rohri channels) by an island called Bukkur. The Bukkur island thus provides the best spot for a river crossing. 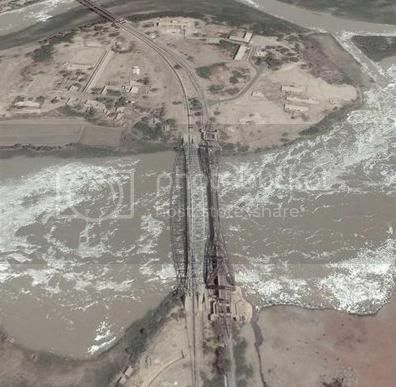 See the satellite photo below, which shows two river channels between Sukkur and Rohri. 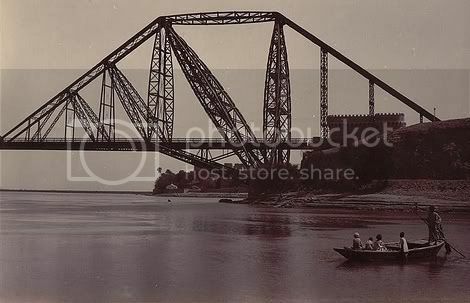 The river channel between Sukkur and Bukkur got bridged by 1885. The river bottom here is rocky so it provided solid foundations for masonry piers. This bridge got completed with three girder spans of 90, 230 and 270 feet. A 2007 photo of this bridge can be seen here. Bridging the channel between Bukkur and Rohri was not so easy. The river bed here is not rocky but silty which made it difficult to build a bridge pier. Therefore bridge designs were put forward to build a bridge without a pillar. One such design was for an arched bridge but it was not considered in 1870s. Interestingly later on in 1962 the river was bridged using a very similar design that came to be known as the Ayub Arch. Between 1872 and 1882 bridge survey was conducted and different people suggested 5 different bridge proposals. None of them was considered completely feasible at that time. An engineer by the name of Sir Alexander Rendel was then called in and he proposed a design consisting of two anchored cantilevers, each 310 feet long, carrying a suspended span of 200 ft in the middle. Interestingly, this design was considered feasible and later came to be known as the Lansdowne Bridge. The girderwork of this bridge was given to Westwood, Baillie & Co. of London. The bridge was first put together in the contractor’s yard. The 170 feet tall cantilevers of the bridge when assembled, made quite a conspicious scene in London. 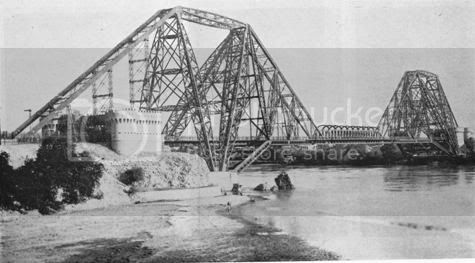 By 1887 the steel work started to arrive at Sukkur and Rohri. The bridge construction was then started under the supervision of F.E. Robertson and Hecquet. Their names are written to date on a plaque on each cantilever of the bridge. The construction of Lansdowne bridge was no joke. It is said that bridge designer didn’t thought much about how the bridge would be built in real life. Giant derricks, each weighing 240 tons and each being 230 feet in length had to be erected leaning out over the water and at the same time they had to incline inwards in the plane at right-angles to the line of the bridge. And as if that was not difficult enough, horizontal tie girders 123 feet long and weighing 86 tons each had to be assembled at a height of 180 feet. This indeed was a challenge in 1880s. When both cantilevers were completed, work started on the center span. The bridge designer had intended that 200 ft long span would be assembled on boats and then hoisted up. This plan did not work in practical as Indus remained quite violent 6 months of the year owing to floods. In the end Robertson built another temporary bridge to provide a platform on which the suspended span could be put together. This temporary staging wieghed 56 tons. The permanent girderwork of the 200 ft span was erected and riveted in four and a half days. This is a good going even with today’s standards. In 1880s Robertson’s men didn’t have pneumatic tools or electric drives. The construction of Lansdowne bridge claimed 6 lives. Four men felled from the dizzy heights and 2 were knocked out by falling tools on them. The cost of bridge was Rs 2,696,000 including Rs 276,000 that were spent on foundations only. On March 19, 1885, Lansdowne bridge was tested by running coupled L class locomotives and a train giving a gross load of 786 tons or about 1 ton per foot. The train crossed the bridge at a speed of 56 kmph (35 mph) and it caused a deflection of 8.9 cm (3.5 in) at the center of the 250 m (820 ft) span. Lansdowne bridge was inaugurated on March 25, 1889. End of March is usually very hot in Sukkur, therefore the ceremony was scheduled for early morning. 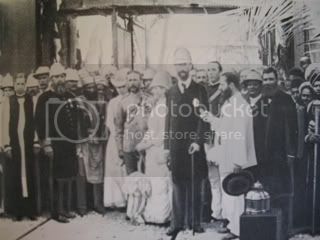 The chief guest was Lord Reay, Governer of Bombay who was deputising for Lord Lansdowne, the Viceroy of India. Consecratoy prayers were offered by the Bishop of Lahore. The bridge was declared open by unlocking a big ornamental lock which was used to shut down the iron gates of the fortified entrance to the bridge. This lock was designed by J.L. Kipling, CIE, Principal of Mayo School of Art in Lahore and father of famous poet and author, Joseph Rudyard Kipling. After the lock was unlocked, people attending the ceremony walked across the bridge and then adjourned for a breakfast followed by toasts under a shamiana (tent). In 1889 when the bridge was opened, the heaviest locomotive on this section weighed only 73 tons. This weight was divided on 16 wheels including tender. With increasing loads, it became necessary to strengthen the bridge. Two such strengthenings were carried out in 1910 and 1939 by removing the dead weight of the bridge. In 1939, 200 tons of dead weight was removed from the bridge. This allowed eight engines coupled together with an axle weight of 17 ton to cross this bridge. The bridge was lightened by removing roadway decking. Two feet of walkways was retained. The road traffic between Sukkur and Rohri was diverted via the Sukkur (Lloyd) Barrage. While Lansdowne bridge is a feat of construction, not many people agree on whether it is aesthetically pleasing also. 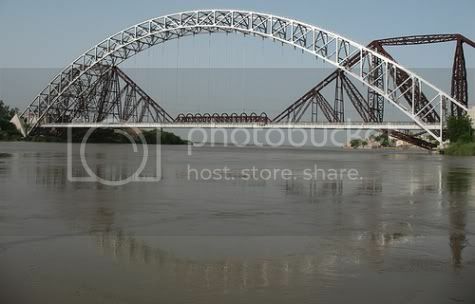 The appearence of the cantilever bridge at Sukkur is bizarre in the extreme and the structure is economical in neither weight of material nor cost of shopwork. Contemplating the monstrosity of the general design, one would expect that in point of economy and detail construction, a fair degree of excellence had been attained. But neither is this the case. There are many ways of reducing the unsupported lengths of the great uprights and raking struts, and consequently of reducing material; but as these would involve some calculations of stresses beyond those of the most elementary kind, they were probably not deemed worth the trouble…. 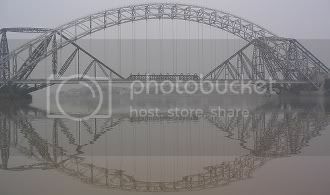 A derrick, the half of an English roof-truss, a Whipple girder, the other half of the roof-truss and another derrick, are very excellent things in thmeselves, but to string them together upon one line, thereby making a bridge, is not engineering, nor is it architecture. 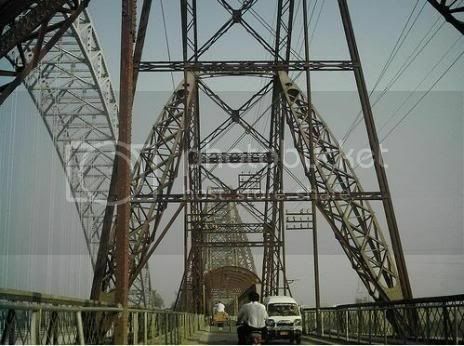 1872-74: First site survey is made of Rohri-Sukkur area by J.Ramsey to bridge Indus here. He proposed a 650 feet long suspension bridge. 1875: The survey was continued by Major General Sir James Browne who recommended a stiffened suspension bridge with cables formed of steel links and a span of 786 feet. Photo to the right is the satellite image of Lansdowne bridge and Ayub Arch. (1) Railways reached Sukkur from Karachi. (2) Sir Guilford Molesworth suggested a three-hinged arched bridge. (3) J.R. Bell suggested a parallel truss cantilever bridge with a main span of 680 ft.
1882: A scheme of a bridge with 250 ft spans supported on masonry piers was proposed. This design was almost chosen when a severe flood in the river took its bed depth down to 100 ft and this design was shelved. July 11, 1884: Publication of the Engineer called Lansdowne bridge design as a “monstrosity” which “is not engineering, nor is it architecture”. 1885: The Indus channel between Sukkur and Bukkur island got bridged. 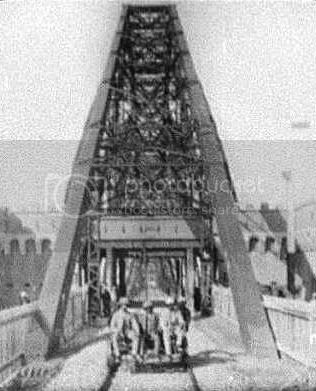 1887: The steel work for the Lansdowne Bridge started to reach Sukkur from the Westwood, Baillie & Co. of London. May, 1887: Bed plates for the Bukkur side of the Lansdowne bridge Cantilever arrived by the end of month. 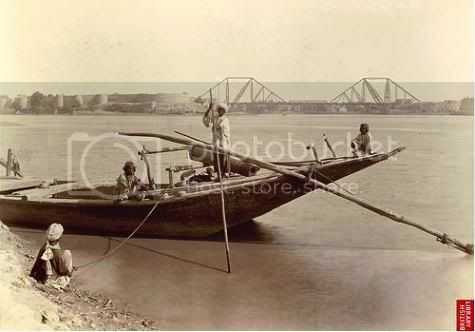 Septemer, 1887: Full supply of steel works for the Rohri side cantilever arrived at the site. March 19, 1889: Lansdowne bridge was tested by running coupled L class locomotives and a train giving a gross load of 786 tons or about 1 ton per foot. March 25, 1889: Inauguration of Lansdowne Bridge. 1910: Bridge strengthening was carried out to increase the load it could carry. 1924: Permissible speed of trains on the bridge was reduced by 8 kmph (5 mph), after deformation and temperature stress was discovered. 1936: Harold Wood Robinson who was deputy chief engineer of bridges, prepared an outline design for a two hinged arch design to replace Lansdown bridge. The drawing was prepared in the Bridge office in Moghalpura, Lahore but this project didn’t see light of the day. 1939: Bridge strengthening was carried out to increase the load it could carry. This time 200 tons of dead weight of the bridge was removed. 5. Around the World in the 1890s. I wish, we had time machine, that we could have traveled in the past to see how this amazing construction was done. So the construction of Lansdowne Bridge claimed 6 lives. Four men felled from the dizzy heights and 2 were knocked out by falling tools on them. I will see this amazing beach on my next holiday trip to Pakistan. good effort keep it up!! !